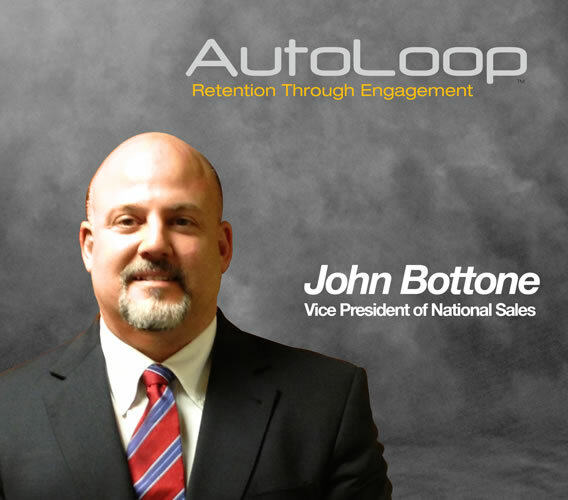 AutoLoop™ announced today the addition of John Bottone as Vice President of National Sales. Bottone will be responsible for driving sales and maintaining support for strategic partnerships, OEMs, individual dealerships, and dealer groups. Bottone has over 20 years of sales and business development experience within the automotive industry. Most recently Bottone was with Auto Point, LLC, where he was able to double to the company’s revenue two years ahead of schedule, despite the sluggish economy. Since 2005, AutoLoop’s commitment to “Retention Through Engagement” has helped automotive dealerships nationwide increase sales, improve client retention and achieve overall higher satisfaction ratings. With an all-encompassing platform that monitors customer DMS activity in real-time, AutoLoop automatically triggers personalized custom messages through voice, email, SMS and direct mail to precisely targeted customers. Since 2005, AutoLoop’s commitment to “Retention Through Engagement” has helped automotive dealerships nationwide increase sales, improve client retention and achieve overall higher satisfaction ratings. With an all-encompassing platform that monitors customer DMS activity in real-time, AutoLoop automatically triggers personalized custom messages through voice, email, SMS and direct mail to precisely targeted customers. An Inc. 500 company tracking over 40 million dealership customers and nearly a billion individual communications initiated, we’re passionate about making AutoLoop America’s best customer retention partner for progressive dealerships.